Some of us were a bit disappointed to see Ambrosia on Church Avenue close a couple months back, as it was one of the few places within the borders to get a half-decent veal parm. 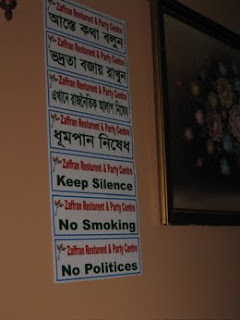 I took it so personally that I boycotted its successor, Bangladeshi joint Zaffran, out of pure spite. Luckily the Village Voice was there to take up the slack and tell us all about the place. That sounds almost good enough to take them off my blacklist. I'm also rather fond of their No Politics policy, as evidenced above. Has anyone gotten around to eating here? Tell us about it in the comments.